Ok, so maybe the headline I chose for this post is a tad too presumptuous, as I’m sure that there are plenty of other things that could be good to include in this post. However, I do believe that this is a bloody useful Santorini guide. I have been incredibly fortunate lately as I have now visited this island twice in less than a year. I am actually sitting and writing this post whilst currently on the plane going from Santorini back to London, I just had to put this down straight away once it’s still fresh in my mind. Both my recent visits to Santorini have been part of a week’s long Island hopping trip around the Greek island group, Cyclades. I highly recommend this way of exploring the country and getting the most out of your holiday. You can find a post here that I shared a few weeks ago, that is filled with tips and info about Island hopping in Greece. As well as including some info about a couple of the islands I have visited. However, I decided to do a post specifically about Santorini, as I feel there is just so much to cover! Btw, note that the official name for Santorini is ‘Thira’ and this is usually the name that comes up when booking ferries etc. Read my travel guide post for Mykonos here! Driving back to Oia as the sun was setting after a whole day of driving around the entre island. When my good friend Linn and I first planned our trip to Santorini back in the summer of 2017, we were quite overwhelmed when it came to picking a location for our hotel. 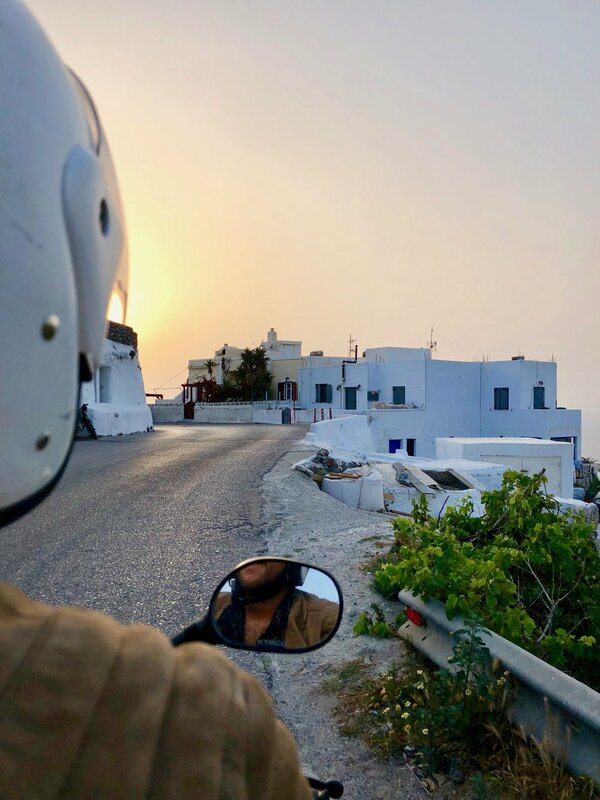 Did we want to stay by one of the volcanic beaches, be close to the airport, stay close to their island-capital Thira, or stay at the very scenic top end of the island - Oia? Because of travelling on a fairly tight budget, we decided on a hotel outside of the cities - but somewhere that was still within a 10-15 min walk from Fira and about a 30 min bus drive from Oia. This location was totally fine for Linn and me, and the hotel was reasonably priced - however, I knew that when visiting again I would absolutely love to stay in Oia. For me personally, I would rather stay for a shorter period and pay a bit more for the perfect location, then to stay for a long time but having to spend a big chunk of my holiday either in a taxi or on a bus. 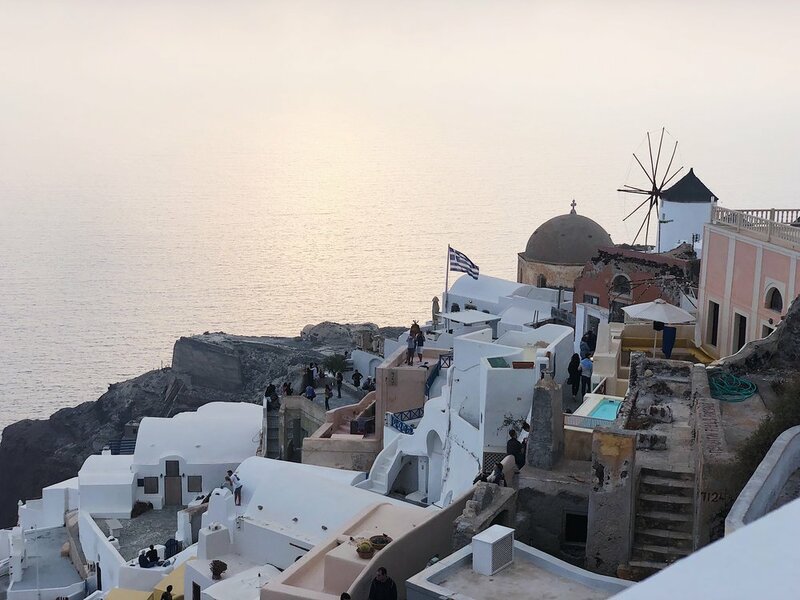 Oia is very expensive though, so I understand it’s not always doable staying there, and Santorini is definitely still worth a visit when staying at other parts of the island too. But Ben and I did decide to book a hotel in Oia, and that is where we have spent the last two nights. Yay! But each person’s preference is different, and Santorini has several areas which are all quite unique. So further down in the post is a list of a couple of good location to stay at. Let’s start with Oia. As mentioned earlier in this post, Oia is the super picturesque but expensive area located at the very top of the island. It’s not very big, but it's filled with shops, hotels and restaurants and it's known for its beautiful view of the sunset. There are no cars around, just lots of narrow cobbled streets and you are high up (hence the insane view) and therefore not close to a beach. However, most of the hotels either have a communal pool or even a private one where you can cool down whilst enjoying this stunning place. Worth pointing out is that Oia is packed with tourists. When I was there at the beginning of September, you could barely move in the streets sometimes. So that is a bit tiring of course, and every single inch of every street was filled with people who were all wanting to watch the sunset. A tip here is to pre-book a table at one of the restaurants that has a sunset view – this way you can eat and enjoy the sunset in peace and quiet without being walked over by thousands of tourist. These restaurants aren’t cheap of course and most of them make you buy a minimum of one bottle of wine with your food. Bit strange, but guess they can do that with high demand. If your budget is tight then I recommend saving up for a meal at one of these sunset restaurants for one of your evenings in Oia and go to more affordable places for the rest of your stay. It's totally worth it. We had our ‘sunset meal’ at the rooftop part of a restaurant called Sunset Café. The view was amazing and the food was great – and the prices weren’t that much higher than a meal out in London. Can totally recommend going there – but make sure to book ahead and ask for a table on the rooftop with a view. I actually didn’t manage to get in touch with them prior to our trip, but we walked passed and booked a table for our last night there once we arrived at Oia. And regarding the tourists, I must say that there were a lot fewer people when I visited at the very beginning of May. So Oia might be a place to visit a bit off season. There was also quite a lot of amazing hotels a bit outside of Oia, but still within walking distance. These hotels are probably also great to stay at as you can then enjoy the beautiful sea view as well as the view of Oia, without living in the middle of all the tourists. Fira is the capital of Santorini. It has the same amazing view that Oia has, but Fira is bigger and more cosmopolitan with endless shops and restaurants. This part of Santorini is also very pricey, and I didn’t think it was as pretty as Oia… but still a very beautiful place of course. Fira is located fairly central on the island and is much closer than Oia is to both the airport and the ferry port. So location wise Fira is a lot more practical. Kamari is a coastal village on the east side of the Island. This part of the island is a lot flatter than the western part, and therefore doesn't have the dramatic cliffs that Santorini is so famous for. The beach has volcanic sand, so the sand is grey/black and not very soft. The sand also gets extremely hot so you need to wear shoes when walking up and down to the water. It might not be the most comfortable of beaches, but it certainly has quite a unique look. There are lots of different hotels and restaurants along the beach strip, and they all looked pretty great! We stopped at Kamari beach for lunch and really liked it there. It felt like the party side of the island, as lots of the hotels and restaurants had lots of bars around the pools etc. Probably a fun place to stay :) But I wouldn’t go there especially for the beach though. If you are island hopping then I recommend enjoying the unique cliffs and view that Santorini has to offer, and instead enjoy the very beautiful beaches at some of the other islands like Naxos or Anti Paros. Parissa looked pretty similar to Kamari, it’s just a bit further along the same beach line with the Mesa Vouno mountain parting the two villages. We actually thought that we could drive from Kamari to Parissa along the beach, and just quickly cross the mountain. Well, we were wrong… the drive up Mesa Vouno was beautiful, lots of little steep turns back and forth that became a bit tiring to drive up after a while – but a cool place to have visited with the quad bike. However, you can only cross the mountain by foot, which meant that we had to drive all the way down again. Between these two volcanic coastal villages (Kamari and Parissa) I would personally have chosen to stay at Kamari as this village is a bit more central and easier to get to. If you google ‘things to do in Santorini’ I bet these beaches will come up as some the top suggestions. It did for Linn and I at least, and we ended up visiting these beaches on our first day on the island. We took a bus to the port of Akrotiri which is the closest bus stop to the Red Beach. From Akrotiri port you can walk to the Red Beach in about 10 minutes or less, but you can’t reach the white and black beach by foot. By chance, when Linn and I were walking along the sea from the bus stop there was a small shuttle boat taking people between the beaches. The man working on the boat was shouting out ‘red beach, white beach, black beach, so we went to see what it was. Basically, for €20 per person (or it might have been €10, I can’t quite remember) you could go to and from the beaches as much as you liked for that day. The boats where going to and from each beach around every 30 min, and you just jumped off at the beach you wanted to stay at for a bit, and once you wanted to go to the next one you just went back in the next boat that was doing a drop off/pick up. We only went off at the white beach which was a small beach with white pebbles surrounded by white cliffs with a blue/green tint. On the way back, the boat stopped at a small blue lagoon where we could have a little swim before being dropped of back at the port. Visiting these beaches was defiantly a lovely thing to do, but the beaches aren’t as impressive as it might sound. This red (more like red-ish/brown can be seen all over the island, and the black beach is basically a small version of Kamari and Parissa beach. So it’s only worth doing this if you have a day to spare, as I wouldn’t prioritise visiting these beaches over other things that you can do in Santorini. Down at Akrotiri there are some super cute traditional Greek restaurants though, so if you do end up going down to these different coloured beaches then make sure to have your lunch down at the Akrotiri port J And if you do rent a quad bike, then it's totally doable to drive the whole distance of the island and back in a day, and that’s how Ben and I visited Akrotiri when we were there. Ben however was not very impressed with the red beach which was the only one we visited. 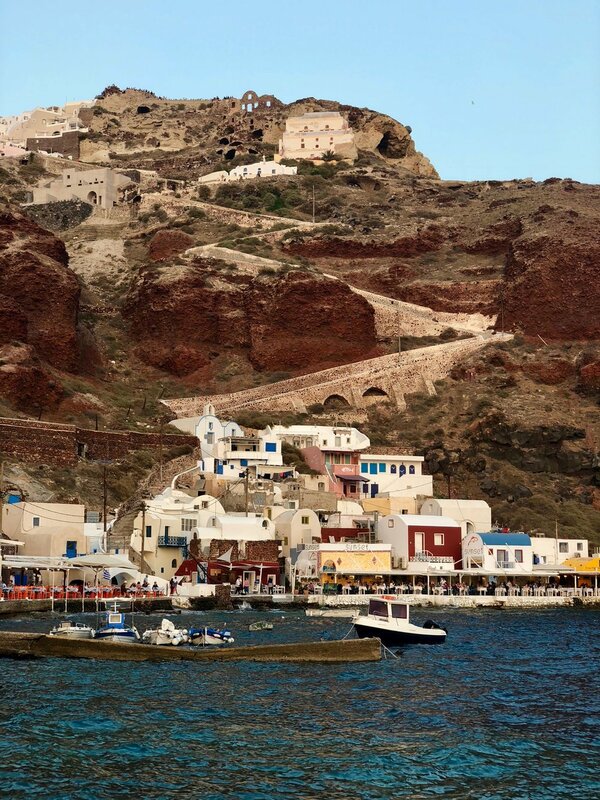 There are lots of other things to do in Santorini like going on a boat trip to the volcano which is located on a small island right next to Thira (Santorini). There are lots of different companies offering day trips on a sailboat, where you end the day watching the sunset from sea. If we had more time there, then I would have loved to do some of these things as well. But we prioritied renting a quad bike and driving around the island, which I can highly recommend. It was lots of fun driving it and the perfect way to explore the island! FACE ROLLERS - DO THEY REALLY WORK?